Last week AUD was stronger than USD due to the Yellen’s speech which affected many currency pairs but at the end of the week the pair declined correcting its bullish trend for a couple of times but reversed up again. Today retail sales stats for February and building permits report are going to affect this pair and for the week the rate decision by RBA will get all the attentions. Recently the price has been moving above the SMA of 50 which is above the SMA of 100 climbing the ascendant channel marked in green. Early today the price fell getting closer to the H4 pivot point at 0.76430. 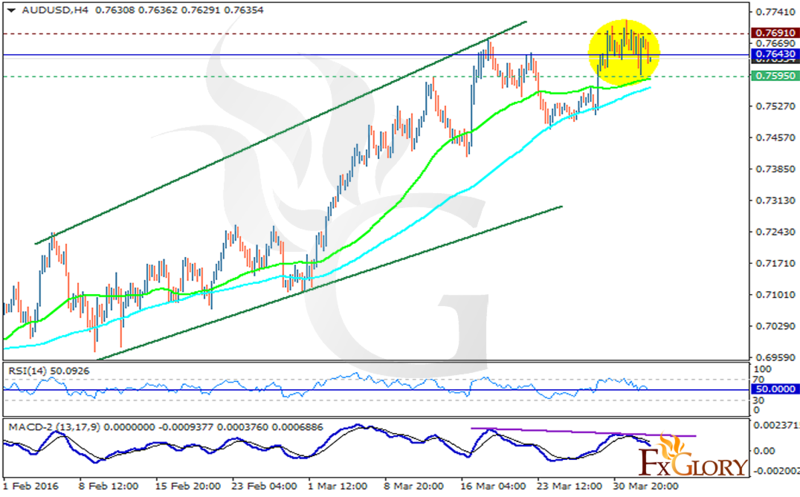 It is finding support at 0.7595 with resistance at 0.7691. The RSI indicator is on 50 level and the MACD indicator is showing a downward trend. At the moment there is no enough signs for traders to decide on their orders but bearish would more probable as the price is correcting.